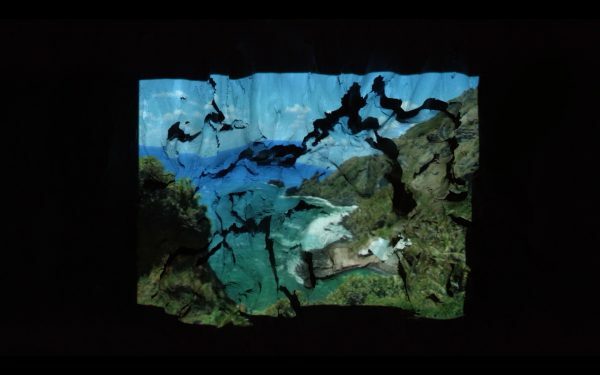 This moving image work incorporates a digital image projection onto a surface of clay. Hands interact with the clay. Digitally processed light falls on flesh and matter. Attempting to make this JPEG more tangible in some way, the landscape depicted is moulded, smoothed, sculpted – reworked/reconstructed, distorted — stretched ~~ pulled apart. The image is from a place 9000 miles from England. To get here it bounced between the footprints of Galaxy 18 and NOC ~ revolving west to east. The audio narrates a dialogue between the artist and Melva, the tourist administrator of Pitcairn Island. This dialogue with a remote islander functions as a critical reflection on ideas of elsewhere and the imagination of place. The projected image and its reworking/destabilizing further troubles these ideas while visually contextualising the distant participants. The critical narrative of connectedness (and/or its lack) functions to reveal that the production is contingent on exchange and technological limits whilst highlighting what is taken for granted in the Western technological climate (data costs and labour’s demands on time).